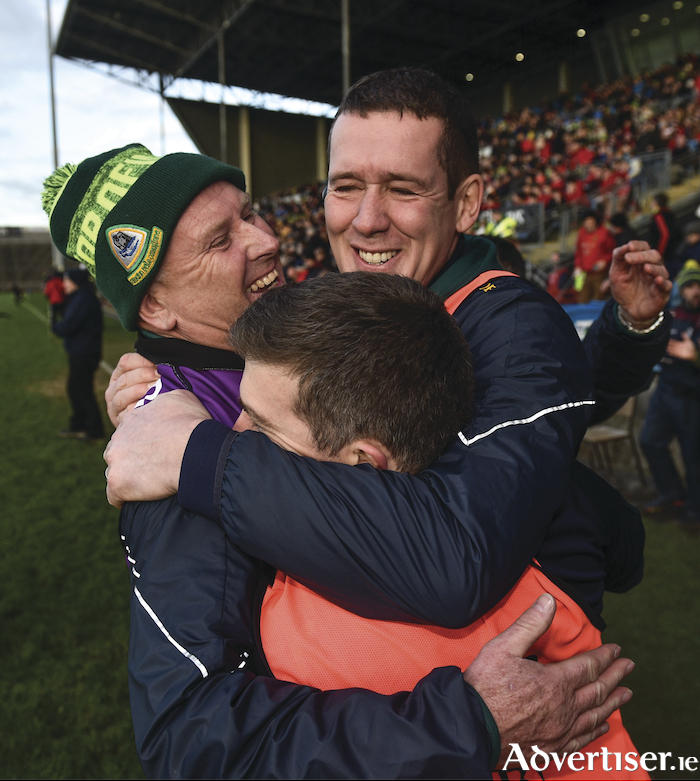 Corofin manager Kevin O'Brien, centre, celebrates with waterman PJ Riley, left, and selector Joe Kenny following the AIB Connacht GAA Football Senior Club Championship final match against Ballintubber at Elvery's MacHale Park in Castlebar, Mayo. Photo by David Fitzgerald/Sportsfile. Corofin senior manager Kevin O’Brien and his backroom team are really getting the hang of winning provincial titles. The club won its ninth ever - a sixth title since 2008 - and a third in-a-row last weekend after a workmanlike 2-10 to 1-09 victory over Mayo champions Ballintubber. O’Brien who won an All-Ireland club medal with Corofin back in 1998 was delighted with their second half display. “We went in at halftime concerned as we were not doing well around the middle and they were causing us a lot of problems. However, when we started flooding that area with bodies that improved and we had a better balance with Mike (Farragher ) out there and Daithí (Burke ) at wing-back. “We had to shake things up a bit and at half time we said to the lads - that they were being asked big questions, the same questions as they have been many times over the years and they fairly responded in the second half and came up with the right answers." O’Brien acknowledged that Corofin’s strength in depth was a big factor in the win. While some people are already talking about the big games ahead, O’Brien correctly wanted to acknowledge last weekend’s achievement.